South Canterbury NZ rivers provide an abundant playground for all manner of water pursuits. Ideal for a wide range of water-based activities such as boating, yachting, jet-skiing and swimming, the Central South Island rafting and kayaking areas are particularly well known. These experiences are easily accessible within a day trip from Christchurch or a short drive from any South Canterbury town. 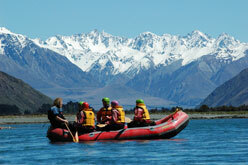 At the foot of the rugged beauty of the Southern Alps flows the mighty Rangitata River. This stunning mountain scenery formed the backdrop for 'Edoras', in the Lord of the Rings movie trilogy. Visitors from all over the world can enjoy a full day of adventure here, rafting the exhilarating rapids of the Rangitata Gorge - famed as some of New Zealand's most exciting stretches of white water and widely recognised as one of the best rafting experiences in New Zealand.